SXSW is fun but exhausting. I listened to a couple of speakers, and they were ok, but I wanted to see cool stuff. 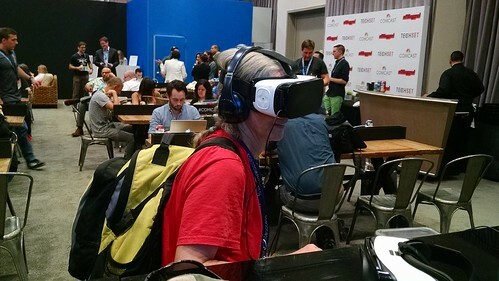 So I wandered into the Comcast Lounge where I got to try a comfortable VR headset that showed me a fun 360° view of a NASCAR race -- from the stands, to the pit crew, to inside of a car during a crash. Visually it was pretty fun, but the audio from the headphones should have been better. Then I met up with my friend Vicki and she told me about a parade of giant puppets that was going to happen on 6th Street. I'm glad she told me, it was amazing. Later, I went to the Mr. Robot party where I rode the Ferris wheel and got a free T-Shirt. I was disappointed that I didn't get a mask, but the T-shirt it very cool and I had a great time. WARNING - turn your sound down low, this video is loud, but you want to hear the music. Then I waited about an hour at the bus stop while the CapMetro app kept claiming that the bus would be there any second. Lucky for me, there was a rooftop party with a great DJ right next door and the people watching was top notch, so I was happily entertained while I waited.